Every year, doctors prescribe hormone replacement therapy (HRT) — also referred to as menopausal hormone therapy — to hundreds of thousands of women experiencing menopausal symptoms. One of the most widely prescribed drugs for HRT is made from animal waste. The drug is Premarin, an estrogen-therapy drug manufactured by Wyeth Pharmaceuticals (now a division of Pfizer), which also produces Prempro. Every year, thousands of pregnant mares are confined to PMU farms in the U.S. and Canada, kept in stalls too small to take more than a step or two in any direction. The cumbersome rubber urine-collection bags that mares must wear at all times chafe their legs and prevent them from lying down comfortably. Mares are given limited access to drinking water so that their urine will yield more concentrated estrogens. And although horses need daily exercise, some mares are not let out of their small stalls for six months. 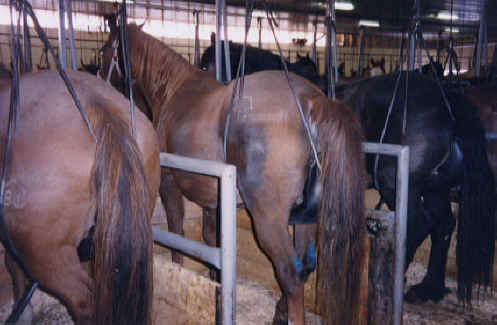 Some farm managers tie up horses so tightly that they cannot lie down at all in their narrow stalls. Because farmers find sufficient bedding costly and bothersome to clean, the animals frequently have no protection from the cold concrete floor. Moreover, farmers restrict the amount of water given to the mares because water dilutes the concentration of their urine, making it less profitable. Their food supply is similarly inadequate, and they do not receive sufficient veterinary care. Most mares are never removed from the stall and allowed to graze. Deprived of exercise, they cannot utilize their natural athleticism and sociability, kick up their heels, stretch their muscles, or flex their joints. The vast majority of Premarin mares give birth to a foal every year. Afterwards, they are almost immediately impregnated again. If they fail to become pregnant, they are sent to slaughter. If they do become pregnant again, their foals are taken from them at the premature age of just three to four months. Most mares naturally resist separation from their babies so they are often whipped, kicked, or beaten with an electric prod until they finally allow their foal to be taken. The thousands of foals who are born on PMU farms each year fare no better than their mothers. 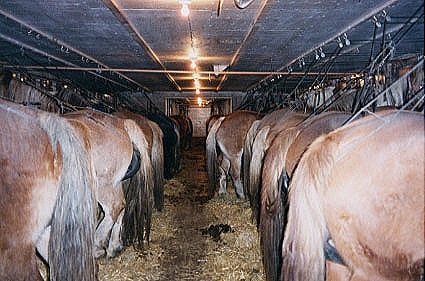 Some are used to replace exhausted mares, many of whom have been confined to PMU farms for up to 20 years. But most of the remaining foals, along with the worn-out mares, are sold at auction, where they are bought by “kill buyers” for slaughterhouses. Thankfully, the number of pregnant mare urine (PMU) farms in North America decreased in 2010, from 400 farms at the peak of manufacture in 2003, to 26 ranches, but this news is tempered by rumors of PMU farms emerging in places where horse slaughter is generally accepted such as China, Kazakhstan, and Poland.